Mike Jennings' photos of White Horse Alley provoked such a response, particularly from people who remembered, or knew people who lived in, the little cottages behind the White Horse itself, that we thought it would be a good idea to feature a comparison between the area as it was in the early 1970s and the present day. The 1970s picture, taken from the Paul Hough collection, is reproduced full size below. The obvious difference between the now and then shots is, of course, that the cottages were still recognisable as such in the early 1970s. In fact the middle one of the three appears from the photograph to have been more or less intact at that time, and there might even have been someone living there. Does anyone know if that was the case? The one furthest away from the camera in the 1970s shot seems to have lost its upper storey and to be close to the end of the line. This was the cottage which, in our earlier Diary entry, provoked the comparison with the 'smallest house in Britain' on Conway Harbour. It was a very tiny house indeed. Looking at the 2012 picture it is not at all clear which houses the surviving walls actually belonged to. There seems to have been much rebuilding of those walls and those who never saw the cottages in earlier days could be forgiven for not knowing that that length of wall in the middle of the shot was ever part of a building. But that grey sheet of corrugated iron seems to have a raised doorstep underneath it and so is probably the location of the doorway of the middle cottage (the window having been filled in to form a solid brick wall) and the length of low wall beyond it may well be the last remains of that tiny cottage next door. If you own the copyright on this image, or know who does, please let us know. From the Paul Hough Collection, the Lewin Street end of White Horse Alley as it was around the early 1970s. 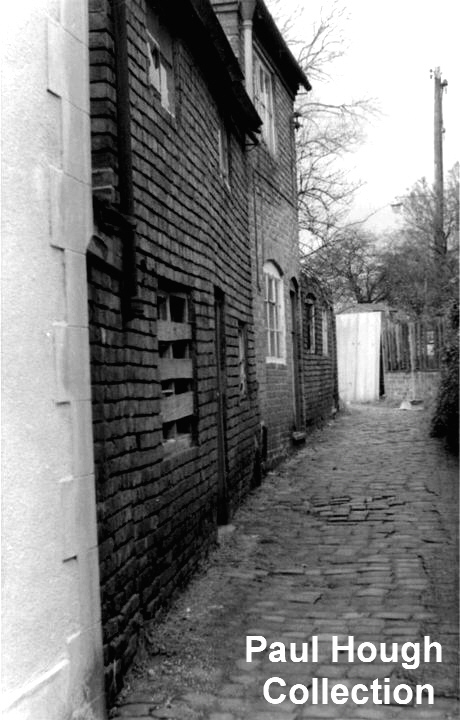 The rear wall of the White Horse is on the left and between that and the boarded up house next door is what looks like a bricked-up alley or ginnel. The three cottages in this little row are all of different sizes and different designs, and appear to have been built in a piecemeal fashion, most likely by various builders and over a lengthy period of time.